Join us 24/7 in our Beautiful Adoration Chapel! 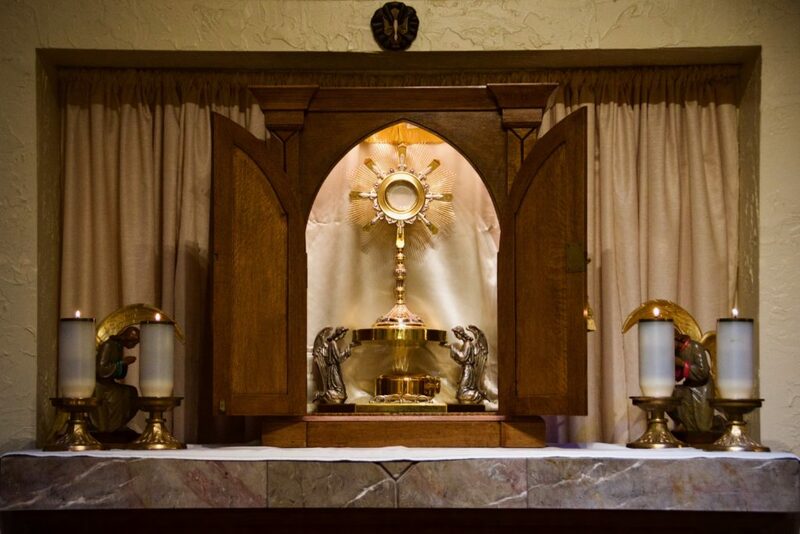 Our adoration chapel is open during the hours of 7:30a.m.-8:30p.m. After 8:30pm a code is required for entry. Contact our parish office for more information. Church of the Ascension is committed to having perpetual prayer with our Lord in the chapel 24 hours a day, seven days a week. In order to accomplish that, we encourage parishioners to sign up for a regular weekly or every other week holy hour with the Blessed Sacrament. Please contact Debbie at 913-485-8918 or debora.suzanne@gmail.com if interested in getting on the schedule or visit the scheduling program here. If you are available occasionally to sub for those who have regular hours of prayer, you may also indicate your availability by visiting our schedule here. If you need a sub, please contact Debbie and she will add it to the list. We have adoration parking spots designated for those participating in prayer in our chapel. For Information regarding the Respect Life Adoration Hour Click Here. Join us for Face-to-Face, Eucharistic Adoration with praise and worship music on the first Sunday of the month, 7:00p.m.-8:00p.m. in the Sanctuary. Open to all, this is a wonderful event for families and youth!